When I have to survive during the work week I have to use my time wisely - especially during my lunch hour. Sometimes I will pack a lunch in tin foil that I can bake or broil in the toaster oven at work. Sometimes I will cook at home in the morning and bring something prepared to work. When I do that I usually eat it all before 10 am. Today I was a little unprepared for lunchtime so I had to improvise a bit. As a result, a meal was made that was a Survivor Diet first, once again. In preparation of the upcoming fluke season, I knew that I needed to stock up on some bait. this meant putting the killie trap out every chance I could get between now and Saturday. Last year the killies were scarce and it was unreliable to think I could just put the trap out the night before and be fine. In addition, my trap is vulnerable to vandalism from kids in the park and other anglers who would steal my bait for their own use. I tried a new tactic this time. I tied my trap to an area that is very difficult to reach. It was a little dangerous - and I almost fell into the water while doing it - but I think this location may prevent the occasional tampering. I can easily use a boat hook to grab the rope to the trap when I check it or change the bait. My plan was to check that trap every time I drove by the park going to and from work. When I catch some killies I would relocate them to a holding tank so they could not escape. By repeating this process I should have plenty of bait for the fluke next week. To catch the killies, I put a bit of stale bread into the trap. I have been accumulating this bread in my freezer over the past few months instead of throwing it in the garbage. This is a good recycling process and a way to put unusable bread to good use. Today, on my way home from work at lunchtime, I checked the trap and there weren't many killies in it. Disappointing. However, there was about a dozen little grass shrimp inside the trap. This is not uncommon. I usually see quite a few tiny shrimp in my trap and I usually discard them because they are so small. A couple times I have tried to use them for bait but again, they are so tiny that it seems impractical. I do know that they are a primary food source for the fluke and weakfish this time of year. I always see the little shrimp in the bellies of the fish I catch and clean. Since I had no food to speak of, I decided to keep this small sampling of grass shrimp and prepare them for lunch today. It was more of a joke than anything - as you will see from the photos. 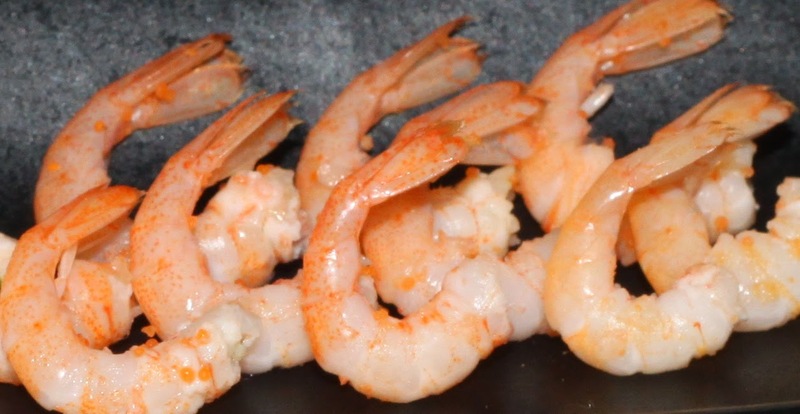 My plan was to quickly cook them like shrimp cocktail, peel and plate them and then take a deceptively close photograph so that they look like normal sized shrimp. It was tedious but I had fun. And after it was all over, I ate them and they were quite tasty. I wasn't surprised - after all they are just miniature versions of their larger cousins. I ate all the heads and shells too. With a little butter and seasoning they were very flavorful. This meal was a SDC first. Pictures can be deceiving. Especially when tiny shrimp look exactly like their bigger cousins.